This is the cover of Rhythm & Colour, a book that I have been working on for almost a year and which finally went to print a few weeks ago. It’s a big book, 624 pages, written by art historian Richard Emerson and is the inaugral title to be published by Golden Hare, a new publisher based in Edinburgh, established by Mark Jones, formerly Director of the V&A Museum. The book is the first examination of the lives of three extraordinary women – Hélène Vanel, Loïs Hutton and Margaret Morris. With the use of recently rediscovered letters, journals and memoirs, as well as a number of previously unpublished photographs, Richard Emerson has uncovered the story of these three dancers of the avant-garde, spanning nine decades and following their journeys from the intellectual circles of London to Wales, Paris and the French Riviera. It has been a pleasure working on the book, learning about these fantastic women, and a delight to work with such a rich archive of wonderful images. 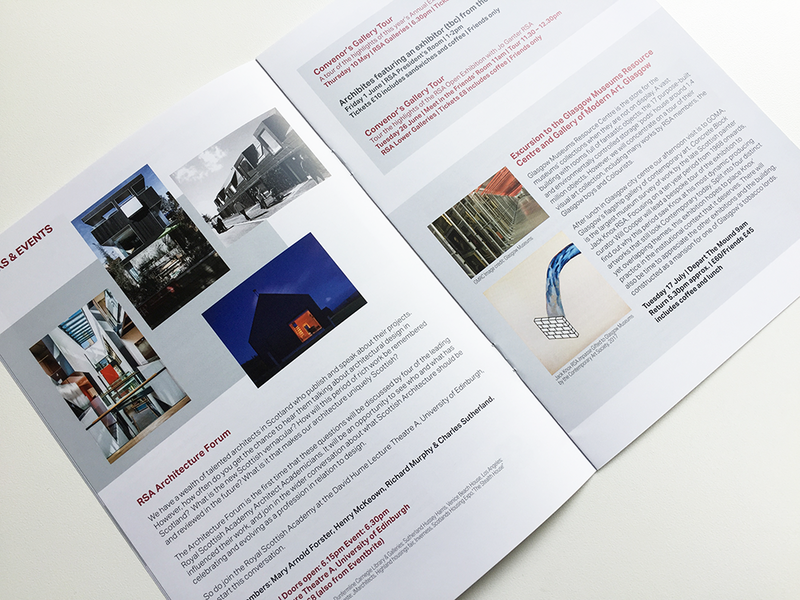 Having re-designed this newsletter in 2016 and then working on three subsequent issues, the Royal Scottish Academy decided to use their in-house designer instead. 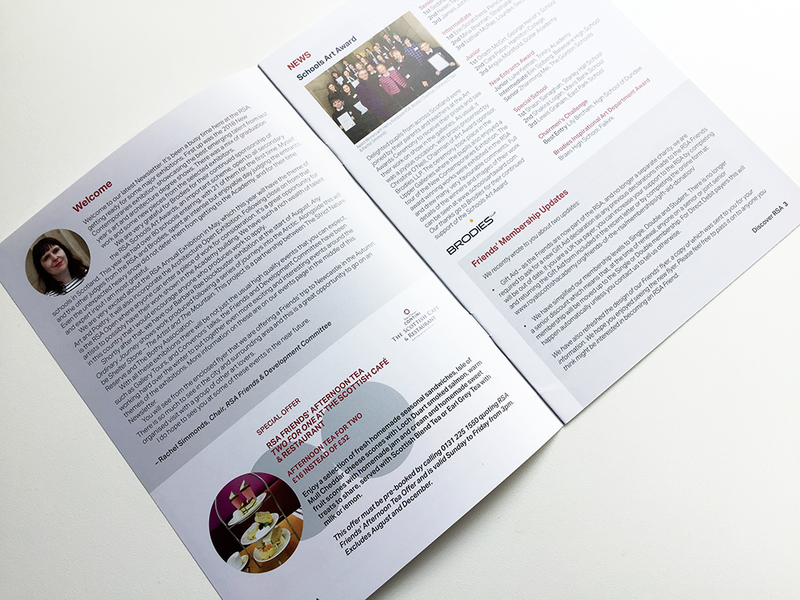 I was approached again in early 2018 to update the design of the newsletter, which had now finally become a 16 page A5 booklet; a change I had planned in 2016, but never implemented as the Academy had not approved this move while I was doing the design. I wanted to create a clean, rationalised design based on a grid, with a limited palette of colours and with just one typeface in different weights throughout. 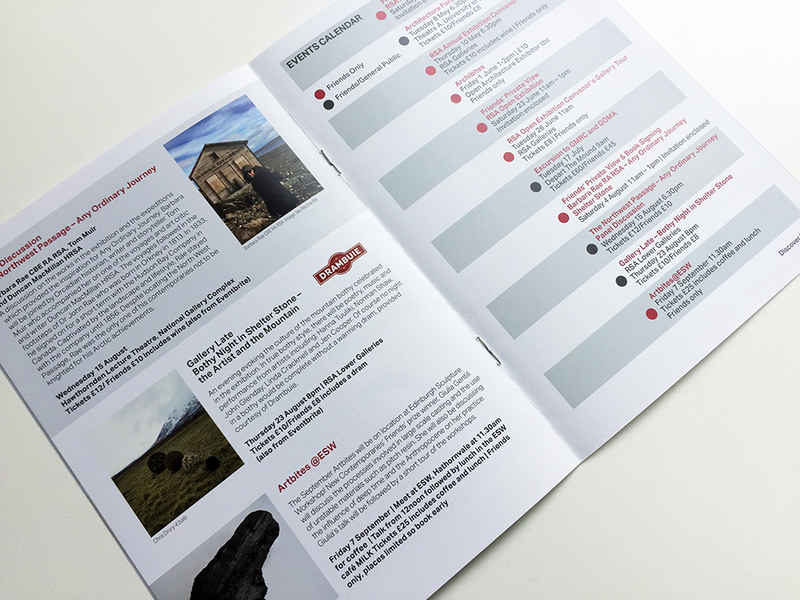 By keeping – almost – all of the typography aligned to the same baseline grid the newsletter looks ordered and rationalised. 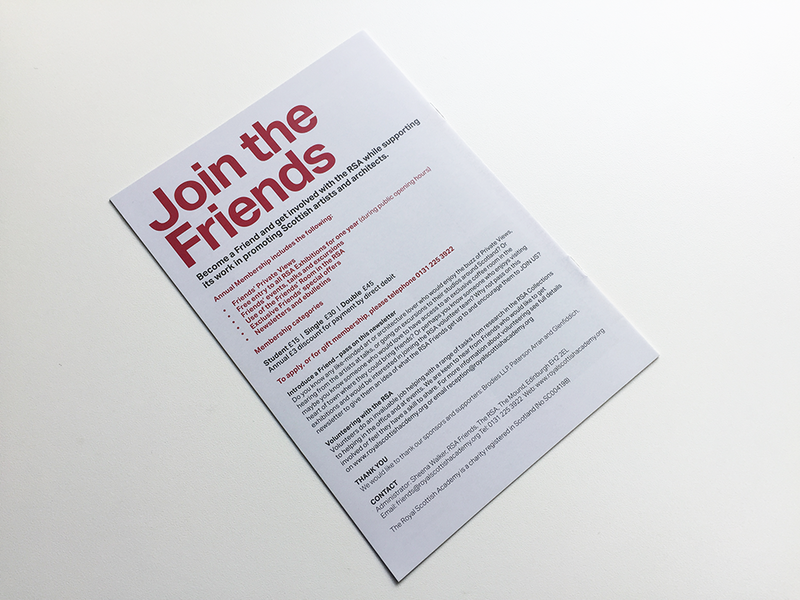 Taking visual cues from the design of the RSA Friends membership leaflet that I had designed the previous month, I used the burgundy that I had used in my refresh of the RSA Friends logo as an accent colour alongside an extended palette of greys. I typeset the newsletter in Aktiv Grotesk, a typeface that sits well with the Akzidenz Grotesk that I used on the logo and that is easy to read, even at a small scale. 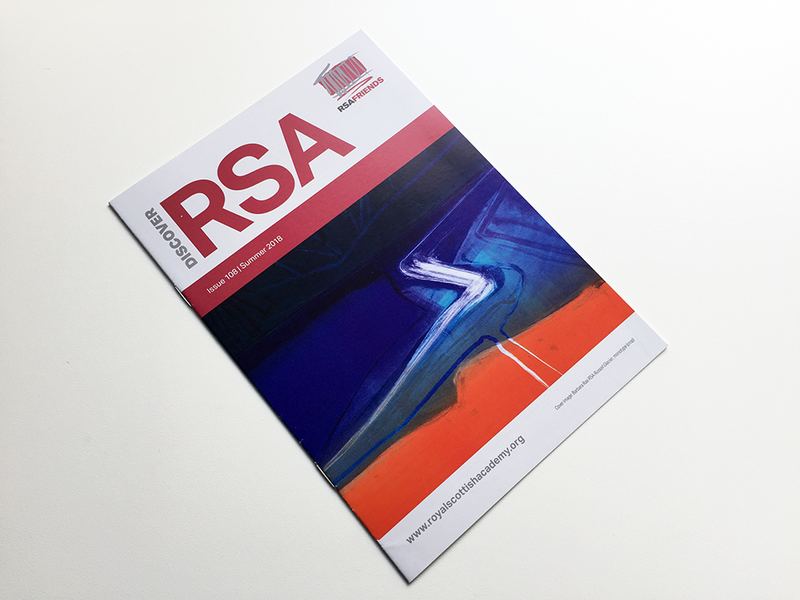 For the cover, I had originally planned to have a new treatment of the Discover RSA logo at the same scale and treatment as the membership leaflet so that they sat alongside each other, making a cohesive suite of printed materials, but the client felt that their membership might confuse the two items so I did an update of the original logo instead. 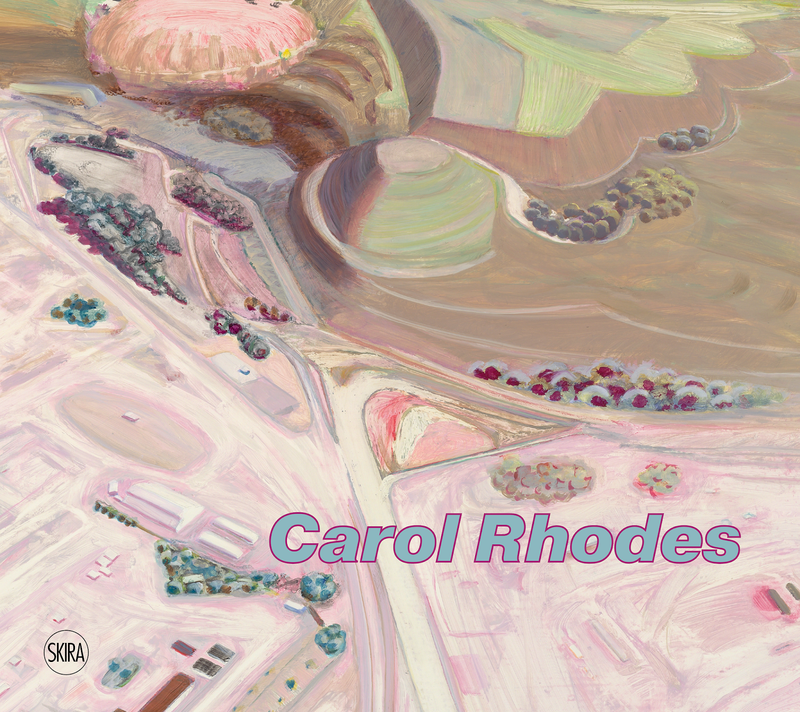 Last week saw the opening days of Glasgow International 2018 during which, the monograph about Carol Rhodes, published by Skira and designed by myself, was launched at the Glasgow School of Art accompanied by a talk about Carol’s work. The book was given a great reception with plenty of copies sold, and I received lots of positive feedback about the design and production. 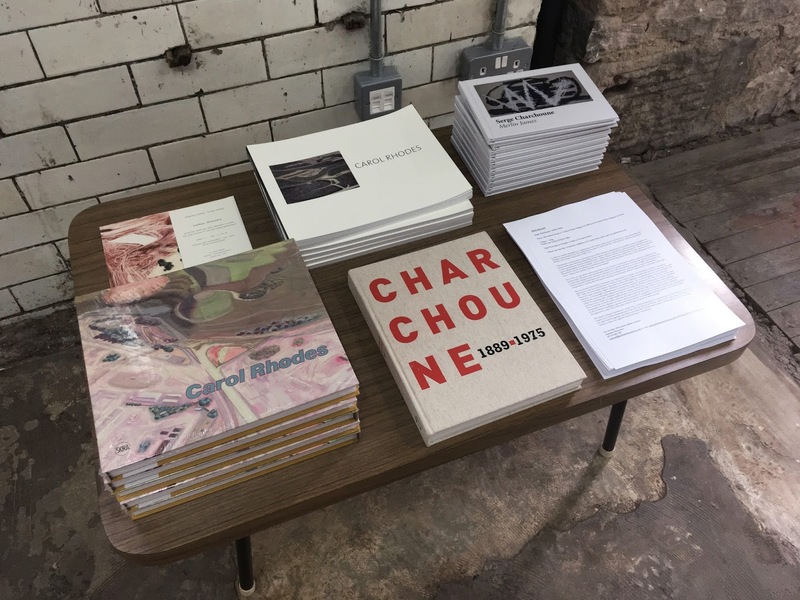 After the launch, I went to an exhibition of works by Serge Charchoune at Andrew Mummery’s space at Oxford House, where I was pleased to see another stack of Carol’s books alongside the Serge Charchoune book that I designed in 2013 for the Talbot Rice Gallery/Smart Art Gallery, written by Merlin James. This new Serge Charchoune exhibition is curated by Andrew Mummery in collaboration with Merlin James and 42 Carlton Place, and focusses on works from the 1930s and the 1960s by the Franco-Russian artist. A new print by Carol Rhodes, based on the painting that appears on the cover of the Skira monograph, can also be viewed at the space. More information about the exhibition here. This is the dummy for Rhythm & Colour, a book that I have been working on for almost a year and which is finally going to print next week. 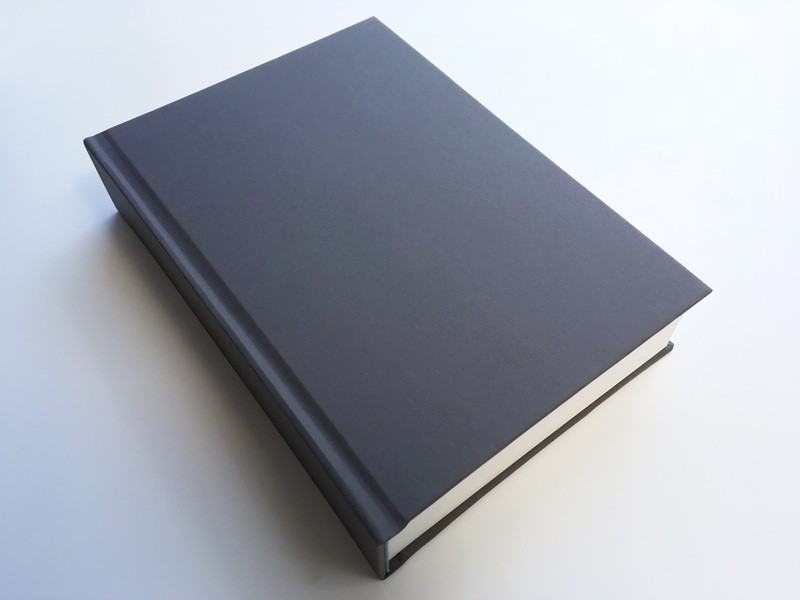 As you can see, it’s a big book, 624 pages, written by art historian Richard Emerson and is the inaugral title to be published by Golden Hare, a new publisher based in Edinburgh, established by Mark Jones, formerly Director of the V&A Museum. The book will be published in June 2018, and is the first examination of the lives of three extraordinary women – Hélène Vanel, Loïs Hutton and Margaret Morris. 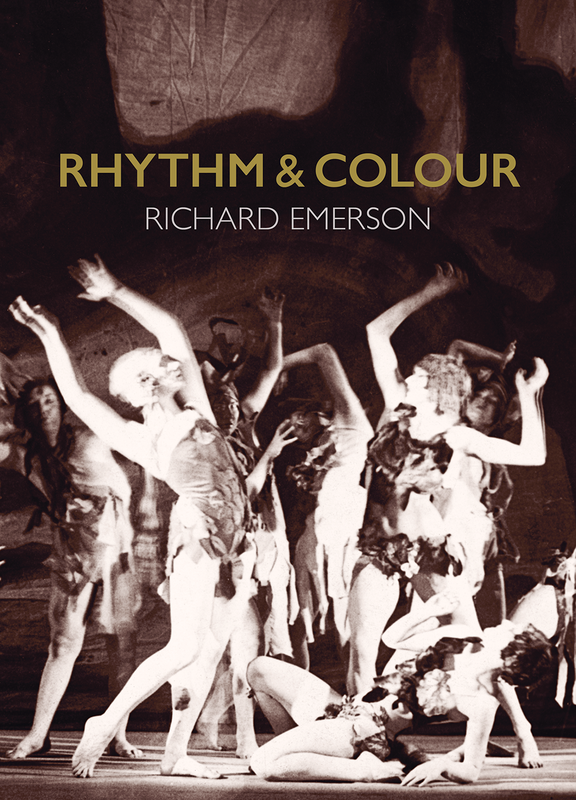 With the use of recently rediscovered letters, journals and memoirs, as well as a number of previously unpublished photographs, Richard Emerson has uncovered the story of these three dancers of the avant-garde, spanning nine decades and following their journeys from the intellectual circles of London to Wales, Paris and the French Riviera. It has been a pleasure working on the book, learning about these fantastic women, and a delight to work with such a rich archive of wonderful images. 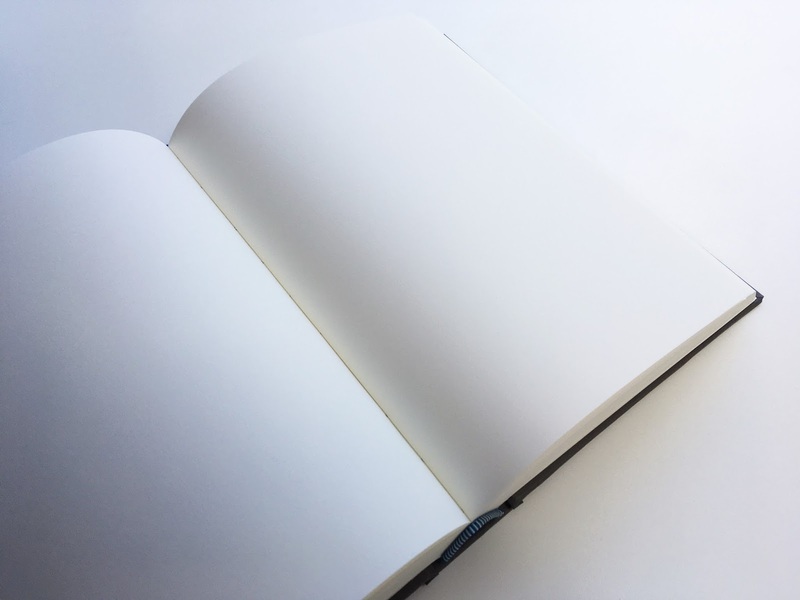 The book will be printed full colour throughout on 100gsm Olin Regular Cream with a cover of Keaycolor Sombre Grey printed in black only; there will also be a full colour dustjacket printed on Olin Regular Cream 150gsm with a UV spot varnish. I am passing on press with the publisher at Allander on Tuesday – looking forward to seeing the book come alive! I am delighted to have designed a major new monograph on the work of Carol Rhodes published by Skira Editore. I was working on the book throughout 2017 and the book went to print in early 2018. This is the cover of the book, with a detail of Rhodes’s 2009 painting, Open Ground and Mudflats. I first saw Carol Rhodes’ paintings in an exhibition titled Construction Site at Glasgow International in 2016: I was intrigued by the scale of her paintings, which, despite taking in panoramic aerial views, are often much smaller and intimate than they might appear in reproduction; the exhibition also revealed the dialogue between her preparatory drawings and the finished paintings, a theme that has been drawn out in the book. It has been a pleasure working with images of Carol’s paintings and drawings, and, once again, a surprise to see the scale of the actual work when I made a visit to the house / gallery / studio she shares with the painter Merlin James, on the banks of the Clyde in Glasgow. It's been inspiring to learn about Carol's engagement with, and commitment to, the life and culture of the city. This new monograph reproduces over forty of her paintings and, for the first time, a significant number of drawings. 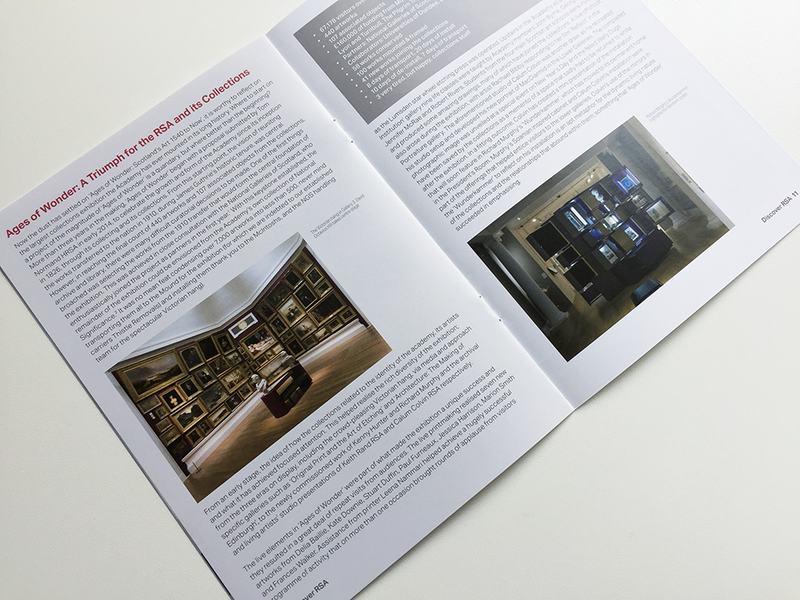 Specially commissioned texts by curator Lynda Morris and art critic Moira Jeffrey discuss Rhodes’s work in the context of her biography and cultural background, and examine its place and importance in contemporary art. 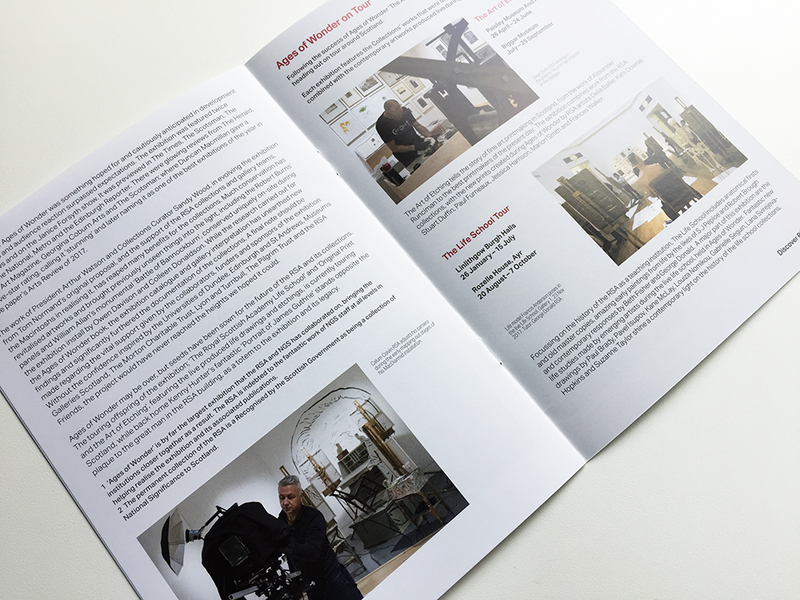 The monograph also includes an interview with Rhodes by consultant and former gallerist Andrew Mummery. Rhodes’s thoughts about her art have rarely appeared in print before and their inclusion here will be especially valuable. As well as the full-page plates, archival and documentary photographs accompany the texts, chronology, exhibition history and bibliography sections. The book provides the most comprehensive overview of Rhodes’s work yet available, and will be a standard reference work on the artist. 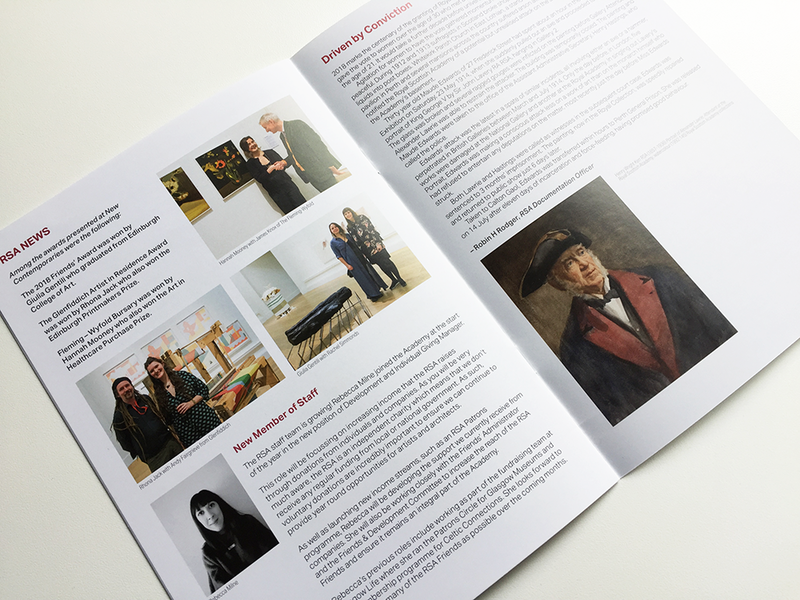 The book will be launched in London on 11 April with an exhibition of selected paintings and drawings at Charles Asprey, 130 Tyers Street, SE11 5HS. Click here to find out more. 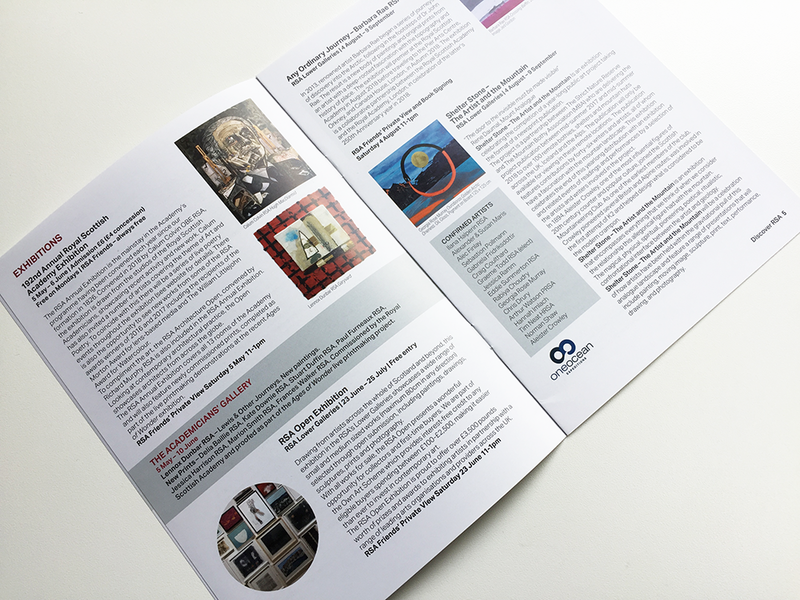 During Glasgow International 2018, there will be a second launch, at The Glasgow School of Art, with a presentation on the work of Carol Rhodes by Kate Davis, Moira Jeffrey, Andrew Mummery and Richard Walker, introduced and chaired by Karen Roulstone, Head of Painting and Printmaking, the GSA. Click here to find out more. Happy Easter! 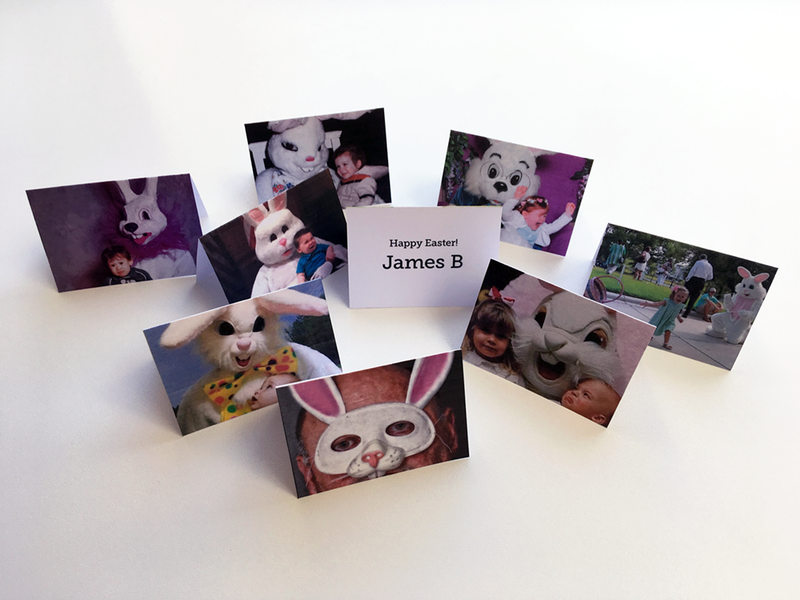 Here are some placecards that I made for our Easter Sunday lunch. The Easter Bunny is a very scary creature and you don't have to look very far on the internet to find some frightening examples of him (or, in the spirit of Stephen King, should that be 'it'? ).